Myanmar Union Adventist Seminary (MAUS), formerly Known as the Union Bible Seminary, started as a small Seventh-day Adventist Mission School in 1938 at Myaungmya to provide Christian education for young people of Myanmar. In 1960, under the direction of Elder W. W. Christensen, progenitor of Seminary program, 15 denominational workers, mostly under high school graduates, enrolled for a two-year training course. They were the first batch of graduates from the school in 1962. 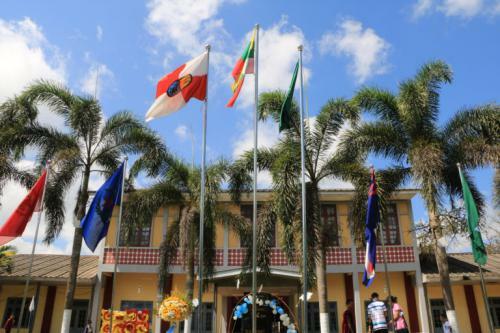 During the 1970’s, the school experienced steady growth as it offered courses for high-school students who came from all parts of Myanmar due to Sabbath problem in government schools. In 1974, the School introduced two programs of study. A three-year curriculum: Ministerial Training Course (MTC) for high-school graduates and a two-year curriculum: Bible Instructor Training Course (BITC) for those who do not pass high school to meet the urgent needs of mission fields. MTC was equivalent to junior college level. The first graduates received their diplomas in 1977. After the school had adopted a plus-two program of Southern Asia Division Education system in 1982, a three-year curriculum was reduced to junior college level curriculum in 1986. In 1991, the seminary introduced a four-year curriculum for Bachelor of Arts in Religion with the approval of the Board of Seminary. In addition, the Seminary was authorized to offer a two-year program for Certificate in Teaching Ministry in 1991. In 1996, the College Board approved additional expansion of Industrial Arts, Business, and Education departments and termination of plus-two program with the intent to offer pure collegiate major courses. Thus the College offered courses for Bachelor of Arts in Religion, Bachelor of Arts in Education, Bachelor of Business Administration, and Bachelor of Applied Arts in Industry and minor in Office Administration. In 1998, the College added another minor course of Home Science and English. In 1999, Bachelor of Applied Arts in Industry was reduced to a minor and Health Education minor was offered. In 2001, it was felt by the majority members of the College Board that the G 12 program in Secondary Academy is essential in our education program to meet the standard of present educational system of Adventist Education. Therefore, MUAS must provide for G 12 program and for a four-year degree program. This means that a student receives a bachelor’s degree after a minimum of sixteen [10+2+4] years of schooling. This program commenced with the 2001–2002 school year.